Postumus is the first emperor of the so-called Gallic Empire that rose and ruled in opposition to the emperor Gallienus and lasted until the surrender of Tetricus in A.D. 274. The Gallic empire eventually included Germania inferior and superior as well as Raetia, Gaul, Britain and Spain. The early life of Postumus is largely unknown though he is believed to have been a native of Gaul from a modest family. He joined the army eventually rising through the ranks to become the governor of Germania Superior or Inferior during the chaotic reign of Gallienus. Turmoil in the Eastern provinces commanded the emperors full attention. 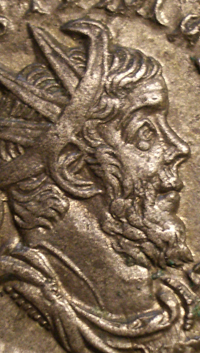 Gallienus was not only defending against numerous usurpers but threats from outside invaders such as the Persians (who had captured and killed his father and co-ruler Valerian) forcing him to leave the Rhine in the care of his young son and Caesar (under the care of the praetorian prefect Silvanus) and select military commanders (of which Postumus was one) to defend against almost constant attacks by barbarian tribes. Sometime in 260 a dispute arose between Silvanus, who was loyal to Saloninus and the emperor, and Postumus regarding booty retrieved from a defeated raiding party. Postumus was ordered to turn over the loot to them but he distributed it to his men instead who then proclaimed him emperor. Postumus and his men laid siege to Cologne where Silvanus and Saloninus were garrisoned. After a brief conflict, the prefect and the emperors son were defeated and put to death. Postumus took the city of cologne and made it the capitol of his new Gallic empire complete with its own senate, consuls and praetorian guard. Praised for his good reign and for his apparent successes against invading Germanic tribes, Postumus was credited with the restoration of the western provinces prompting him to assume the title of Germanicus Maximus. The Emperor Gallienus twice launched campaigns to crush the Gallic emperor and twice failed to do so. First Postumus was saved by the carelessness of Gallienus' cavalry commander, and on the second occasion, Gallienus himself was injured by an arrow while besieging the usurper in a small Gallic town and was forced to withdraw. He made no further attempts to remove Postumus from power and he never gained the personal revenge that, according to one source, drove him to challenge Postumus to single combat, nor did Postumus make any attempt to march on Rome. It is unclear as to the true intentions of Postumus. In his actions he seemed content with a strictly Gallic empire but in his propaganda he was clearly making the claim he was the ruler of all the empire. He never attempted to take Rome and remove Gallienus from power. Even when Aureolus, the cavalry commander under Gallienus stationed in Milan (an important step in any move on Rome) revolted in favor of Postumus, he took no steps to invade Italy. Aureolus would be left to fend for himself, making his own claim to the throne, eventually being defeated and killed by Gallienus' sucessor Claudius II. Yet he did not seem to limit his rule to the Gallic empire in his propaganda. He invested himself with all the traditional titles of a Roman emperor such as pontifex maximus and pater patriae and his coins, at times of higher quality than his rival Gallienus', were decidedly roman giving preference to types like Roma aeterna or pacator orbis, to salus and fides. There were probably numerous reasons for the growing dissatisfaction in the ranks with Postumus close to the end of his life, not the least of which was his refusal to march on Rome to remove the central emperor and legitimize not only his position but that of the men who served him. As long as there was an emperor in Rome, they would forever be Gallic usurpers. This dissatisfaction culminated with a revolt led by one of his commanders, Ulpius Cornelius Laelianus, who was declared by his men emperor at Moguntiacum (Mainz) in 269. Postumus acted quickly, successfully crushing the rebellion and killing Laelianus, but he lost control of his men when he refused to allow them to sack the city. After an almost 10 year reign, Postumus was killed by his own men who raised to the Gallic throne a relatively unknown officer by the name of Marcus Arelius Marius. Marius would be killed soon after to be replaced by Victorinus, a soldier of considerable ability as well as a Consul and tribunus praetorianorum under Postumus.